Now that you’ve got your wide screen TV, surround sound speakers and top-of-the-range Blu-ray player, your next challenge is to install it all. Mounting a TV and speakers securely and safely onto the wall can challenge even the most dedicated of DIYers. Why spend all that time and energy when you can get a professional to do it for you? We can mount your new TV onto your wall and connect it to your other home theatre equipment from your cable and speakers, to your DVD player, stereo and games consoles. Not only will your TV be securely and safely fastened onto your wall – a major consideration for families – but cables will be hidden and your entertainment system will run to optimal performance. We can even advise you on the best angle for your TV and speakers so that you get the best home theatre experience. Telesignal Antenna Systems will upgrade your antenna at the same time – the complete package – so not only will you benefit from a new, modern home theatre, but also, you’ll enjoy a crisp, clear and focused picture quality with no interference. How’s that for service? Even if you just need help installing a new digital TV, Telesignal Antenna Systems can make sure you get the best from your TV with the minimum of fuss. So for a fast, experienced and professional service with a smile – trust in the experts. 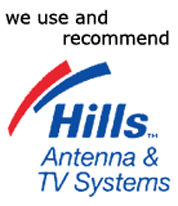 Trust in Telesignal Antenna Systems. Contact us online or call us on 0417 809 403 for a friendly chat and affordable quote. Our payment options include cash, cheque and eftpos – whichever is convenient for you. Efficient and Professional. Fantastic service...I shopped around but as soon as Ian answered the phone I knew I had found the right one...He was friendly and very helpful...The cost, with no hidden extras, suited my pension budget. Would highly recommend this firm to anyone without hesitation. Thank you Ian. Efficient and Professional. Fantastic service…I shopped around but as soon as Ian answered the phone I knew I had found the right one…He was friendly and very helpful…The cost, with no hidden extras, suited my pension budget. Would highly recommend this firm to anyone without hesitation. Thank you Ian.